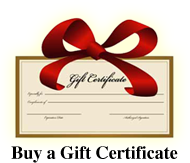 Posted on June 27th, 2013 in Newport Activities, Newport Rhode Island. If you have not yet heard the story of the Red Chair Travels, it is a story about an innkeeper who took a now famous photo of a simple red chair on a frozen pond and posted the photo on her facebook page. The photo inspired a photographer to visit the inn and take photos of the red chair in different settings. 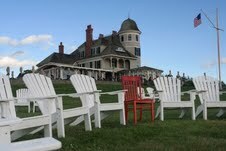 The Red Chair took a trip to several New England Inns last year. This June the Red Chair began a journey that will take it down the east coast and then across the country. The Red Chair Traveled to the Samuel Durfee House in mid-June and we got to show the Red Chair some of what Newport has to offer (there is so much to do here that one would need to visit for many days or more to see everything). We began our tour of Newport by visiting Easton’s Beach and the Cliff Walk-the Red Chair even got to sit on a lifeguard stand! We then took the Red Chair for a drive down Bellevue Avenue to see the famous Newport Mansions, the Red Chair even stopped for a photo with the ‘camels’ at Doris Duke’s Rough Point! It was then off to the Ocean Drive, a beautiful scenic coastal drive around the Southern tip of our island. We took a break and had afternoon tea at the Samuel Durfee House before heading downtown to Newport’s new Queen Anne Square and Trinity Church. We then headed to Bannister and Bowen’s Wharf to check out the shops and restaurants and visit the lobsters at the Aquidneck Lobster Company (the Red Chair even gave a lobster a place to take a break). To see another side of Newport, we went out to Fort Adams and walked around the fort before watching a sailing race in the bay. After a long day of touring Newport, we decided to take the Red Chair to one of our favorite places to watch the sunset, Castle Hill. 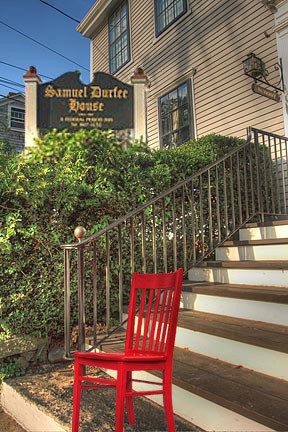 The Red Chair had a wonderful visit to Newport and the Samuel Durfee House before heading to Connecticut to begin the next stop in it’s long journey.